New Birmingham, in Cherokee County, was supposed to be the third industrial metropolis to bear that name. The two other Birminghams, one in England and one in Alabama, had shown how the availability of iron ore could build a city where not even a town had been before. The dreamer in the case of New Birmingham, Texas, was Alexander B. Blevins, a sewing-machine salesman who knew what had happened in the northern part of his native state of Alabama when northern industrialists invested capital to develop the iron industry there. In the 1880s Blevins discovered that iron ore was abundant in Cherokee County and was already mined to supply a foundry at the Rusk Penitentiary. So he dreamed a big dream: a "New" Birmingham, perhaps even larger than the one in Alabama. 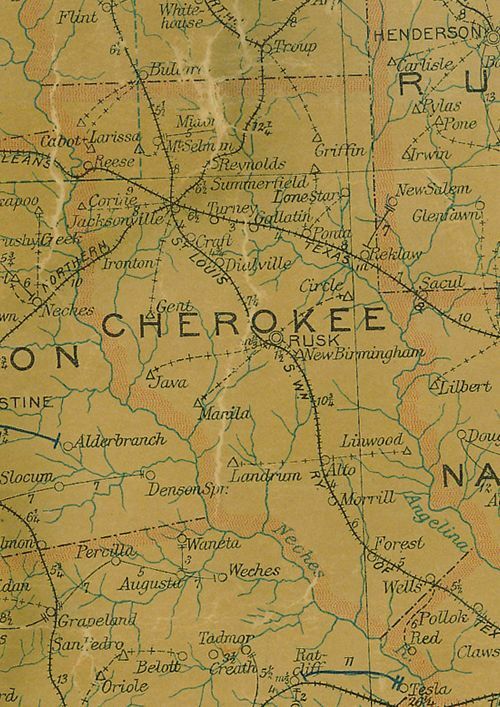 Blevins organized the Cherokee Land and Iron Company with the assistance of capitalists W.H. Hammons, James A. Mahoney, and Robert Van Wych. They leased 20,000 acres and began mining even while they built a fifty-ton furnace that Blevins named the Tassie Belle after his wife. New Birmingham was laid out near the Kansas and Gulf Short Line Railroad. In addition to the furnace, the town soon claimed 2,000 residents who enjoyed the services of a bank, saloons, a newspaper, even the five-story Southern Hotel. Industries included a sash and door factory, a wagon and plow works, an iron pipe factory, and an electric generating plant. New Birmingham, "The Iron Queen of the Southwest," seemed well on its way to prosperity and permanence. It was not to be. The dreamers had attempted too much too soon, and when the Panic of 1893 deprived them of new capital necessary to continuing developing until profits sufficient to sustain the furnace were earned, they were hard pressed to continue. An attempt to involve English capitalists in the venture fell through because of Texas' Alien Land Law, and in 1890 Hammons was killed by a New Birmingham businessman. Then a fire destroyed the furnace, forcing the lay off of over 300 workers. People moved away, businesses closed, and by 1896 only 200 residents, barely ten percent of the population less than five years before, remained. The post office closed in 1906. Most of the buildings in New Birmingham were scavenged during the First World War to provide materials for construction in Rusk, and the hotel, the last building left standing, was destroyed by fire in 1926. Even the rubble of the old hotel was removed in 1932 during the construction of a highway. The Birmingham in Alabama developed into the largest city in that state while the Birmingham in Texas disappeared, remembered now because of a historical marker. Even so, it reminds us that once there was a dream.